Lovely memories are made with thoughtful gifts for the ones we care about. 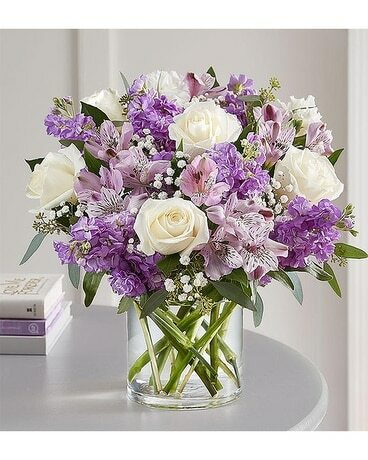 Our charming bouquet is loosely gathered with a medley of lavender & white blooms. Hand-designed inside a clear cylinder vase with cascading greenery all around, it’s a wonderful way to express the sentiments you have inside your heart. All-around arrangement with white roses and carnations; lavender Peruvian lilies (alstroemeria) and stock; accented with baby’s breath, seeded eucalyptus and assorted greenery.